The first documented history of the Château d’Igé begins with a legal document in 1235, bearing the seal of Louis IX, which relates that the Abbaye de Cluny was trying to prevent Count de Mâcon, lord of Igy, from constructing a fortified manor. Shortly after the fall of the Bastille during the French Revolution, the château was sacked and pillaged, with some outbuildings destroyed. The lord of the château, the Count of Morangiers, had to abandon the property and hide in the woods. Perhaps the château was especially targeted because the lord had laid claim to a well and had even gone so far as to enclose it. When the revolutionaries ransacked the property, the enclosure around the well was the first to be destroyed. The château gradually deteriorated until 1972 when Henri Jadot restored and transformed the property into a hotel. 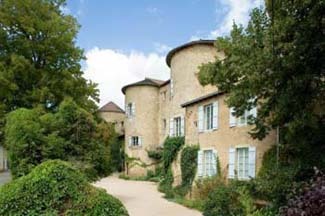 In 1990, Françoise Faucon acquired the property, continuing the tradition of a unique castle hotel experience. This is a lovely place to stay. Guests have been returning here for years, which is a fine testament to the château’s charm and warm welcome. Be aware that some of the rooms are reached up narrow stairs—potential difficulty for someone with mobility problems. Igé is located 14 km. northwest of Mâcon. Upon reservation, the hotel will pick you up at the Mâcon train station. This ivy-covered turreted castle has welcomed guests for over thirty years. Nestled in an old park filled with trees and flowers and surrounded by woods, vineyards, and meadows, you’ll find the château a perfect hideaway from which to explore Burgundy or as a stopping place to or from the south of France. Guest rooms are located either in the main château or in a separate tower. Each is individually and tastefully decorated. Some suites feature four-poster beds; one has a lounge with a balcony. If you wish privacy, try the Tour du Parc, a split-level suite with a vaulted ceiling located on the grounds in the château’s former chapel. Updated bathrooms are found in each guest room, as well as flat-screen TVs—a nod to the 21st century. Dinner is served in front of a huge medieval fireplace in a beautiful beamed dining room or in two other smaller and more intimate dining rooms. The highly regarded cuisine is under the direction of chef Olivier Pons. Much of the produce comes from the château’s own gardens and orchards. Breakfast is served in a spacious sun room, and if the weather is fine, meals may be served outside.